Please don't hate me, but I'm not particularly a fan of Halloween. I know that puts me in the minority, because according to recent statistics, Halloween has become the second biggest retail sales holiday in the US. But I don't do anything for it other than to put together a costume and pass out candy. [Halloween]...had become so frightfully commercialized, overwrought with cringe-worthy plastic decorations, tart-y getups, and high-fructose junk foods. Halloween had begun to lose me, and I suspect was becoming uncomfortably tawdry for many of us. Americans will spend billions (yes, with a "b") on Halloween this year alone, and both the pragmatic and the creative sides of me think we deserve a whole lot more aesthetic whiz bang for all those big bucks. So Susan proposes to help us to go after that aesthetic whiz bang, with 31 beautiful projects, using readily available craft materials and easy-to-use tools. There are over ten unique and beautiful pumpkin decorating ideas included that don't require scooping out the guts. Gotta like that! There are also projects for inside and outside your home, and a few for your own costuming. 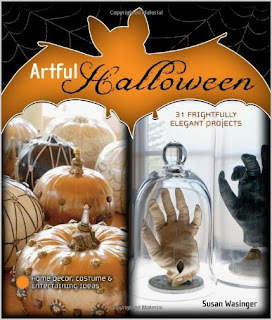 If you'd like to win my copy of Artful Halloween, just leave me a comment below and you'll automatically be entered to win. If you tweet or post on Facebook or other social spots about the contest, you can leave a second comment and be entered twice! With any luck..knock on wood...i should be in my new house by Halloween and what a wonderful way to find new ideas to decorate it. I work beside a school so generally try and make things to put in our office window for the kids to see. my grand children would love a book like this - so here's my name for the draw please!! I only have to look in the mirror (since ageing so ) to scare myself!! Count me in please! I love Halloween! Halloween is such a great decorating and art-ing event! I love it! I tend to go all out for Halloween also but am a huge fan of handmade. The one exception being candy to hand out is store bought packaged for ease of mind of the parents of those trick or treaters. I especially love the kids with hand made costumes but feel for those whose moms are not crafty. My daughter and I are planning to plant a pumpkin patch next year and can't wait! I would love to win the book to share with her! I agree with you--not a big fan of Halloween art but this book looks like FUN!! i would love toget a look at it!! What fun! I love Halloween! 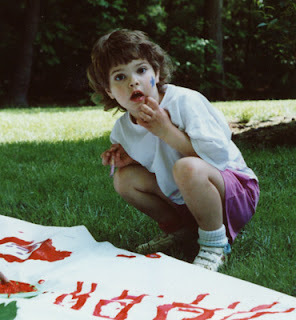 It's close to mine and dad's b-day, so we have been celebrating our "creepy-ness" my whole life! I would love a chance to win this book! This book looks like fun for year-round decorating, not just Halloween! I love the photo of the hand in the jar. Good for scaring the kids, haha! I have a friend who is an over the top Halloween decorator. I'd love to surprise her with something I made from this book. Thanks. I love Halloween, but not the tacky, plastic-y crap. Love your blog - so many good ideas! Sign me up for the free book, and thanks in advance.